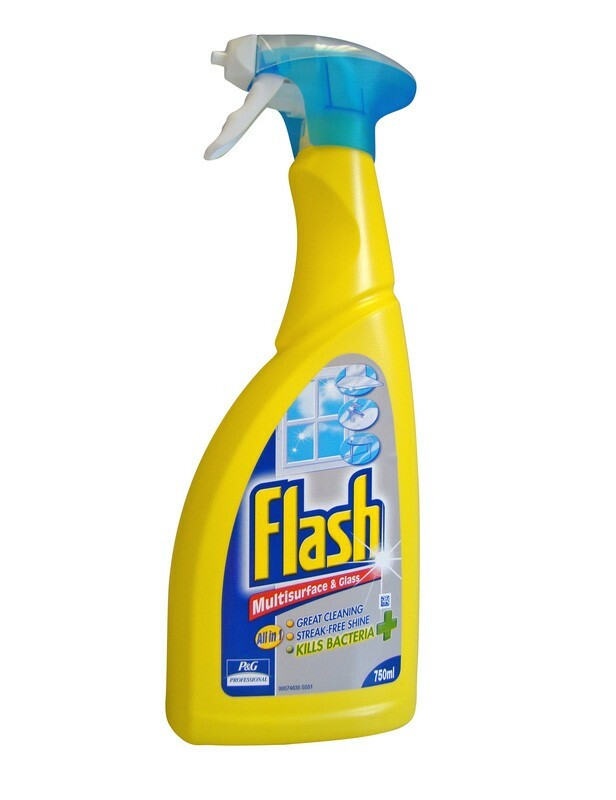 Flash Multi Surface and Glass Cleaner is an all in one cleaner that can be used almost anywhere. As well as providing great cleaning, it will give you a fantastic shine, even on windows, mirrors and any glass surface, such as table tops and screens. It will also kill up to 99.99% of bacteria - giving you great protection wherever you need it. Excellent all around multi purpose cleaner. Full range of Flash products available from stock. Release the spray valve to allow the bottle to dispense. Spray on to desired surface or directly onto a cloth and then wipe clean. On heavy soils or for bacteria kill, leave on surface for 3 minutes before wiping. To clean glass and mirrors spray lightly and then wipe with a dry clean cloth and leave to dry.